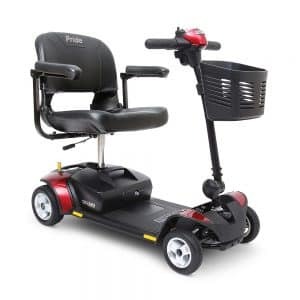 As a global reaching brand, Pride Mobility Products is known for its great innovation and technology that provides those in the limited mobility range with high quality and top performance products, making their lives much more accessible. At Orthopedic Service Company, we pride ourselves with carrying only the best brands that the market has to offer so that we know our customers are purchasing the safest, most high performing mobility aids out there. As a mobility device, the scooter Pride Go-Go Elite Traveller allows its passengers to maneuver safely in smaller spaces so they can facilitate everyday life with smoother navigation. Its compact and lightweight design makes the scooter Pride Go-Go Elite Traveller the fastest way to travel. As an exceptionally stable mobility vehicle, it helps users drive safely around smaller spaces. Its feather-touch disassembly makes it possible for you to disassemble it into 5 lightweight pieces for easier transport and storage. Its 300 lb. weight capacity, speeds up to 4 mph, and charger port in tiller make it easier to go wherever you need. As the mobility experts that we are, Orthopedic Service Company is proud to do everything in our power to help you get to where you need to be, and with the Go-Go Elite Traveller scooter, we’ll get you there. Contact us today and consult directly with one of our mobility experts to know how and where you’ll find the best solution for your specific needs.